Author Angela Addams: The Dark War Release Day!! 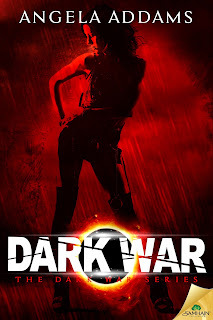 The Dark War Release Day!! That's right, it's finally release day for The Dark War! As Darkness rises, magic is their only defense —if it doesn’t end the world. I've got a contest starting today for $20 Amazon Gift Card...click below to enter. I've also got a blog post and contest starting tomorrow at Delilah Devlin's so click HERE tomorrow! I'll be emailing later today (I'm at the day job) Check your emails, folks! If you want in on the newsletter action, sign up HERE! So, Remember That Time I Almost Died?